We are hiring, join our growing team. If you have experience with inside sales and marketing, check us out! We love our job. We provide the highest levels of service to our clients with unparalleled, industry-specific expertise. We are smart, nimble, efficient, creative and results-driven – just like our clients. 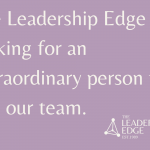 The Leadership Edge is a dynamic, team-based, fast-paced company with a heart, whose purpose is to profoundly impact the pace, performance, and culture of most innovative life science companies in the world. A recognized industry leader in organizational development for the life sciences for the past 3 decades, we continue to expand our team in order to best serve our clients and their mission to positively impact human health. To this end, we are seeking a sales and marketing professional who will blow us away with their dynamic personality, creative ideas, ability to play well with others and commitment to excellence. This is an opportunity to be a part of a dynamic, purpose driven, high performing team that supports an innovative life-changing industry. Working closely with the Vice President of Business Development, the Inside Sales and Marketing role is responsible for two critical areas of operations. For inside sales, the individual will support company-wide growth by assisting our phenomenal Vice President of Business Development with pipeline management of prospective clients from initial contact through the completion of the sales cycle. This may include proposal writing and/or review, prospect and client outreach and follow up, managing of the database and pipeline and partnering in the development of our sales strategy. In addition, the individual will identify marketing opportunities to gain brand awareness and support the success of our programs in our target market. This may include the use of various lead sources including the website, social media and leveraging association relationships for marketing success, determining speaking and sponsorship opportunities that positively position The Leadership Edge with our prospects and clients and executing on a strategic marketing campaign that will have been developed by our marketing consultant. Opportunities for Development: It is our goal to develop this individual into an outside business development professional. Prospect new sales opportunities applying lead generation sales methodologies. Meet or exceed quotas for qualified leads passed to the sales team. Promptly follow up with and qualify marketing-generated inquiries for our programs and services. Research and gather information about targets and develop prospecting lists. Document all activities and interactions in the HubSpot CRM. Efficiently manage prospect pipeline to produce the maximum amount of results, leveraging current prospects, past clients, graduates and referral sources within the CRM. Support proposal writing for standard programs and offerings. Support the production of sales presentations. Attend networking events as a backup, on an as-needed basis. To implement a strategic marketing plan designed to raise awareness about The Leadership Edge and its program offerings, leveraging the new The Leadership Edge brand, resulting in increased sales. Collaborate with the team to develop key marketing messages for various programs and events. Manage Email Marketing including creation, list management, email launch and track click through’s. CRM entry of all new contacts made after meetings, events, and conferences. Create and deploy campaigns that nurture leads over time. Insure the website is current, reflecting program offerings, company successes, media exposure, etc. Update and upload various materials for client and graduate support. 4+ years of sales experience. 4+ years of marketing experience. Demonstrated ability to show initiative and to be a self-motivated, innovative, and independent thinker. Ability to be resourceful on independent projects. Must have excellent organizational skills, including follow-up and follow-through skills. Demonstrated professional behavior in dealing with clients (executives, board members, and scientists), referral sources, and team members. Detail oriented, highly organized, team player who thrives in a fast-paced, multi-tasking environment. Excellent writing skills – sales tools, proposals, etc. Excellent interpersonal skills across a range of contacts including high-level executives, speakers, members, vendors, and staff. Includes effectively employing tact, integrity, confidentiality, diplomacy, and flexibility. Excellent demonstrated PC-computer skills and well versed with a variety of software packages for word processing, spreadsheets and database management, including Microsoft Office 365 Suite. Proficient knowledge of CRM, specifically HubSpot, is preferred. Life science industry knowledge a plus. Learning and development experience a plus. High energy, sense of humor, willingness to do whatever it takes to ensure client success and someone we would love to have over for dinner is a must! 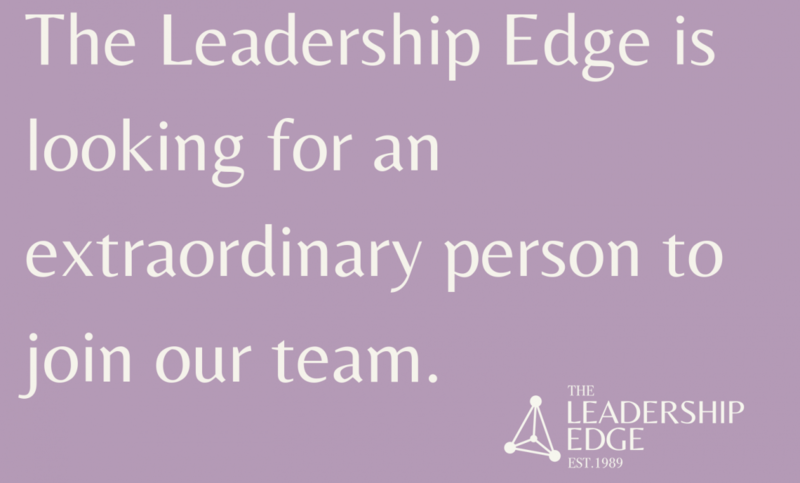 We invite you to submit your resume to Tiffany@TheLeadershipEdge.com. How do you build an empowered board? 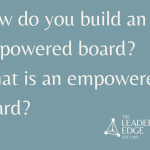 What is an empowered board?